Is your organization engaged in a responsible procurement approach? Or maybe it already puts in place responsible sourcing practices without even being aware of it? 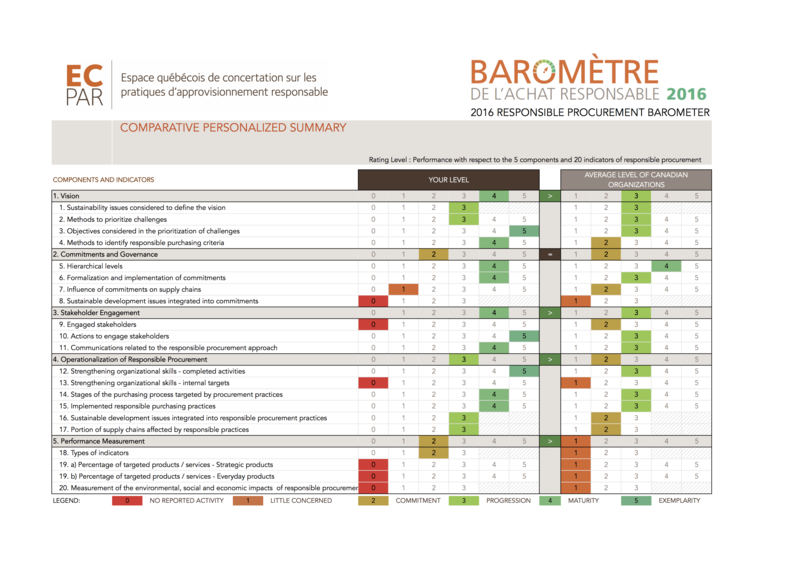 Since 2016, any organization, regardless of its sector of activity, can use the diagnostic tool of the 2016 Responsible Purchasing Barometer to ASSESS IT'S PERFORMANCE AND COMPARE IT. It's simple, rigorously developed, and VERY USEFUL! In Canada, as of August 2018, more than 80 organizations, public and private, have obtained their personalized summary.
" ECPAR's Responsible Procurement Barometer is a powerful tool to situate yourself in relation to other organizations, allowing you to identify your strengths and weaknesses, establish a plan of action, and to give credibility to the direction given to your responsible procurement initiative within your organization. No matter how you score at the Barometer, that's not what's important. What is important is getting an objective view of where you are with your responsible procurement approach and guide you to where you need to go. " Participation to the Barometer gives you access to a personalized summary of your practices, as well as one of the 22 responsible purchasing sheetsdeveloped since 2008.